Info "‘And now for my next trick. I, Wario the Amazing, will single-handedly remove this tablecloth without disturbing a single dish!’"
Party Crasher is one of Tiny Wario's Microgames in WarioWare: Smooth Moves. The name comes from the term "party crasher", meaning a person that attends to a party without being invited. 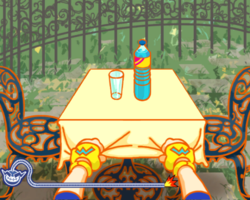 The objective is to pull the tablecloth from the table with Wario's arms without breaking anything on it. The Wii Remote will have to be yanked towards one's self quickly and straightly. 1st level difficulty: A few drinks on the table. 2nd level difficulty: A meal on the table. 3rd level difficulty: A full party set on the table. The music in this microgame is an arranged version of the music from the microgame Practical Joker from WarioWare: Twisted! This page was last edited on December 9, 2018, at 01:29.